MMP (Mushroom Model Publications) is a book publisher based in the U.K. All their books are printed in Sandomierz Poland by their associate Stratus in English. Stratus also does books in Polish too. This new book is hard-cover in 8 ¼” X 12” page size format of 176 total pages. 12 side profiles of the Reggione Re-2000 and two illustrations of the top of it. 10 side profiles of the Bf-109G-6, one 2-view and an illustration of the top of it. 3 side profiles of the Bf-109G-10 and an illustration of the top of it. 5 side profiles of the Fw-190-F8 and one illustration of the top of it. 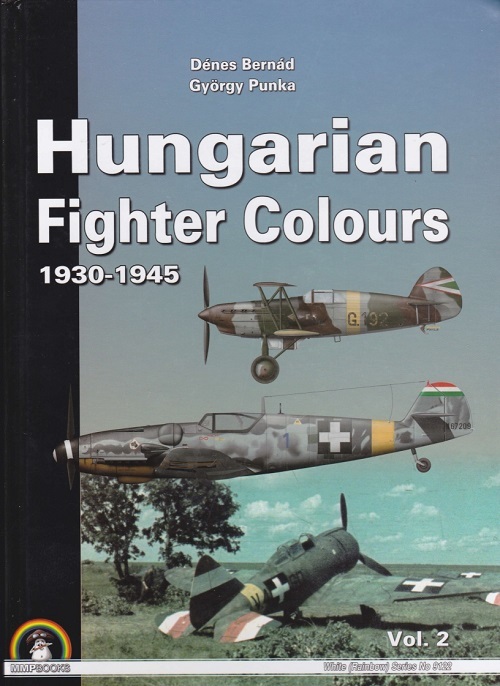 There is a 30 page bibliography at the end of the book that is a wealth of information about the structure of the Hungarian Air Force in WWII. The back cover shows the color art work for Vol. 1, which is the companion to this book, and is reviewed here on INDY AMPS. This book came to me from Casemate Publishing in Pennsylvania in a heavily padded envelope to protect it and 4 other MMP publications. The other 4 will appear in the side soon too. I highly recommend this series of 2 books to aviation historians and modelers. I want to thank Roger Wallsgrove, Editor-in-Chief of MMP and the folks at Casemate for this review sample.